Ethyl formate (EF) is used as a fumigant against insect pests on many commodities. Delivery of EF uses a carrier gas, usually carbon dioxide (CO2), to reduce its flammability. However, CO2 is expensive and can only be delivered relatively slowly. Nitrogen (N2) has been proposed as an alternative. 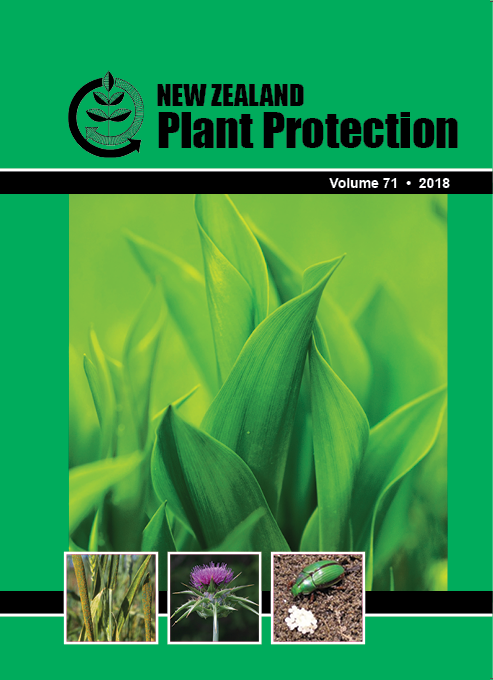 The efficacy of EF delivered using CO2 or N2, was evaluated at 5 and 15Â°C, against two important postharvest pests of kiwifruit (greedy scale (Hemiberlesia rapax, Hemiptera: Diaspididae) and obscure mealybug (Pseudococcus viburni, Hemiptera: Pseudococcidae). Mortalities of both insect species were higher in the presence of CO2 than N2. There was a strong interaction with treatment temperature: N2 at 5Â°C resulted in low mortality across both species. Greedy scale was more susceptible to EF than obscure mealybug across all treatments. Nitrogen as a carrier gas for EF substantially lowered the efficacy of EF as an insecticidal fumigant, relative to CO2. This is hypothesised to be caused by differing respiration rates across temperatures and CO2 concentrations. Solutions for rapid CO2 delivery should be explored over further trials with N2 at low temperatures.